Isabelle was invited to a friend's ice skating birthday party. The invite said that for those kids who couldn't skate, a parent had to go on the ice with them. No problem, right? Well Miss Isabelle has NEVER been ice skating and I've been ONCE in my entire life. I was probably like ten years old. We were destined to be a recipe for disaster. Luckily, the girl whose party it was is not "just" a school friend but a friend and family we have known through town for years. I mean if you're going to embarrass yourself it's always better to do it amongst friends, right? 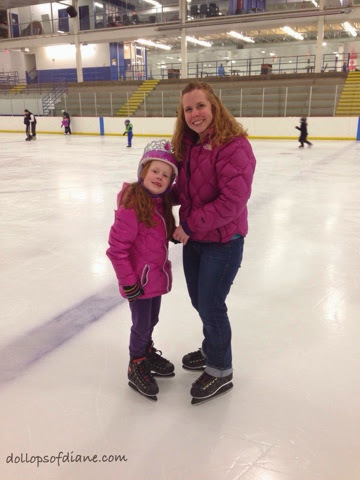 Also, Isabelle had already told all her friends that I couldn't skate and they promised that they could just teach her. Yup, the six year old population had already lost all confidence in my ability to skate. So Tim left work early so that the future gold medalist skaters could head to the party. After one turn around to get the required helmet that I forgot at home, we arrived at the ice. When we got there lots of kids and parents were gleefully gliding along the ice in skates that they owned. Umm...where were all the people who needed to rent skates and had never skated like us? Those people did not exist except for one other mom and son who arrived shortly after us. But as I told Isabelle multiple times, "It's always good to try new things." Note: I was mainly saying this to myself as she was not the least bit nervous. And just like that - we were on the ice. We hugged the wall for a few minutes but then you know what? I could totally stand - easy peasy. I could stand and sloowwwwlllllyyyyy move my feet and get all over that ice. And you know what? Isabelle could too! She fell a couple of times but that was mainly when she tried to go faster. I knew enough to stay at a snail's pace. So yeah, the party was a lot of fun. Isabelle was excited to skate for the first time. I was happy to re-try something new. The kids did a powerful rendition of "Let It Go" on the ice. We both got to enjoy time with our friends and we followed it up with pizza and cupcakes. So if I'm being honest, I think the gold medal might be out of reach for us BUT the bronze is totally do-able.